Within the hymenoptera are two groups of animals: the wasp like groups and the bee like groups. 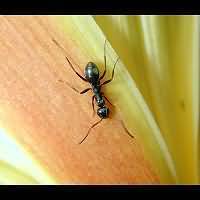 Wasps and ants are built in a typical way: they have the characteristic wasp waist. Sawflies and bees lack this characteristic. Bees usually are very hairy insects, while sawflies look like flies, but you can easily tell them apart. 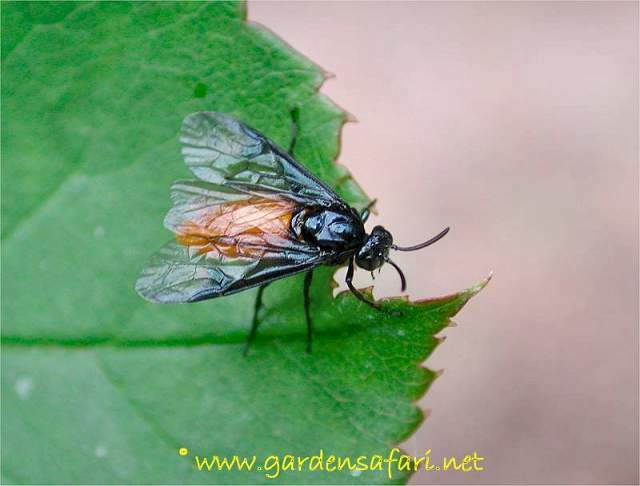 Sawflies have two pairs of wings (true flies have only one) and the antennae differ considerably from those of flies. There are many species world wide and a lot of them are very hard to identify. Especially within the enormous group of parasitic wasps and gall wasps many species are spitting images of one another. 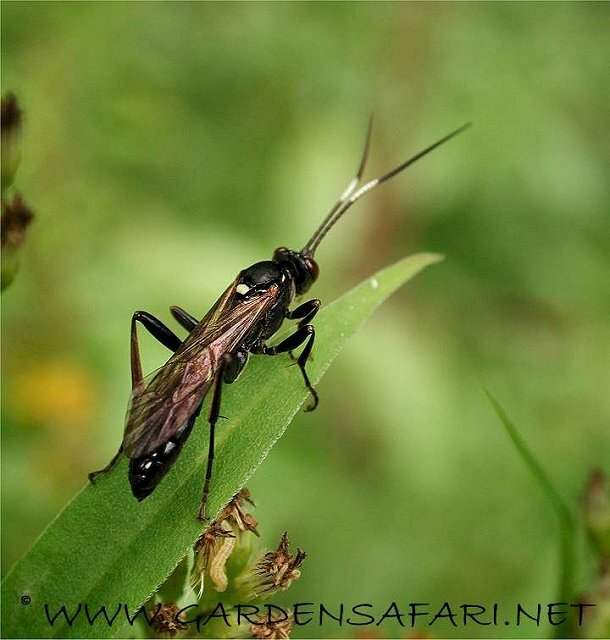 In the Benelux alone there are well over 500 species of Sawflies. The larvae of sawflies are very similar to caterpillars and all are vegetarians. 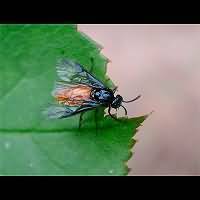 Most adult Sawflies are vegetarians as well, but some are hunters. Sawflies look like flies, for they lack the typical wasp waist. But contrary to flies, they have four wings. There are a number of bigger species, but many species are very small indeed. Sawflies can not sting people, for they have a saw and not a stinger. The saw is used to make a little cut in stems of plants. In this cut the eggs are being deposited. Click here to select a species. This group of wasps is easily identified as a group. All apparently have small wings. They are capable of folding their wings longitudinally when in rest. This also reveals a lot of their body, which usually is black with yellow or red lines or patches. These warning colours are justified, for most species may deliver a painful sting. 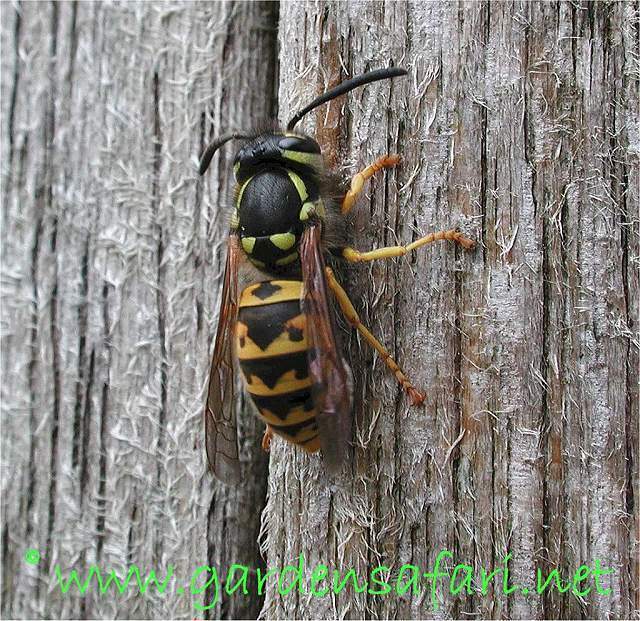 The hornets and yellow jackets are the best known representatives of this group of wasps. 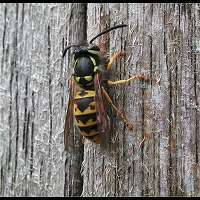 The Yellow Jackets belong to a relatively small group of wasps. We deal with all other true wasps on this page. Some look a lot like yellow jackets, such as some digger wasps. Others are chiefly black and hunt for specific prey, such as the spider wasps. Comprised of well over 1,500 species in Holland alone the parasitic wasps make up the largest group. Some species are rather colourful. Parasitic wasps are notoriously difficult to identify! Usually each species has one or more doppelgangers. 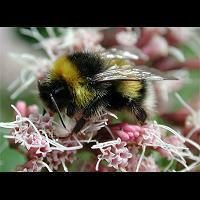 Bumblebees are plump, extremely hairy bees. It is very easy to establish a bee is a bumblebee. Some species are readily identified, but be warned: many species are not as easy to identify as you might think. Besides queens and workers are different and so are the males. 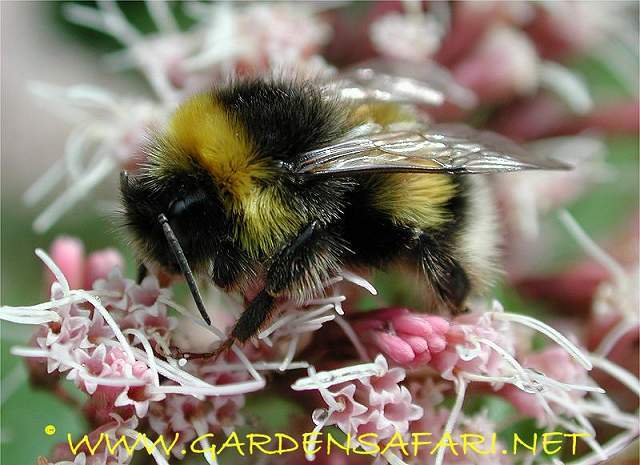 There are but few tropical species, for bumblebees are typical of the colder parts of the world. In the tropics we only find them in cooler regions, such as in higher mountains. 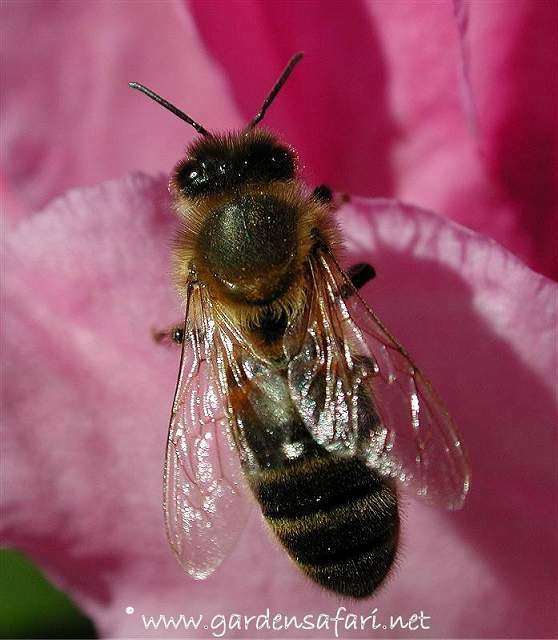 Mining bees are similar to Honey bees, but they are usually more hairy, especially the thorax. They are however never as hairy as Bumble bees are. 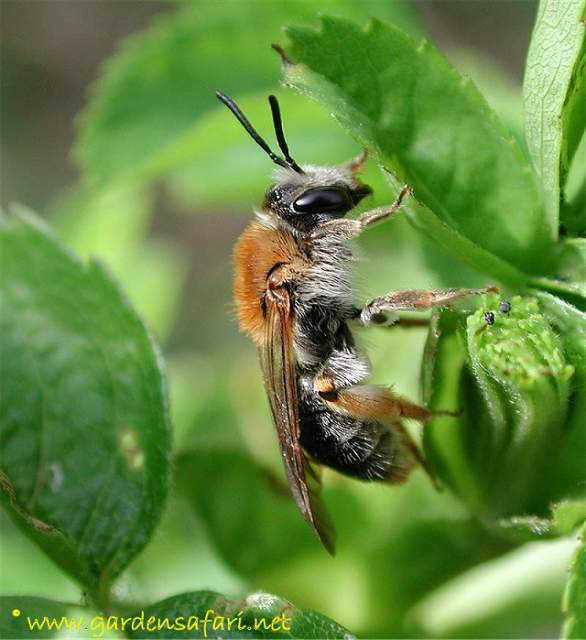 Mining bees do not live in colonies; they are so-called solitary bees. Females dig a mine in usually sandy soil and make a nest at the end of the mine. Even though solitary, females may build nests at the same spot in huge numbers. Mining bees are hard to tell apart at times. In Holland alone well over 70 species are present. On the following pages you will find all other bees we have on our site. 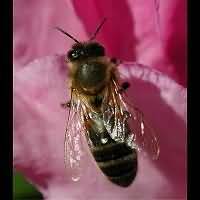 Some are common and well known, such as the honey bee and the mason bees. 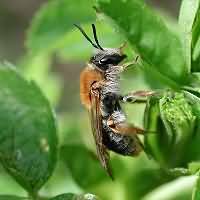 Others are more obscure, such as the wasp bees. At times it is very difficult to tell species apart. The family of ants is a very big family within the wasps. The number of animals is also very impressive. 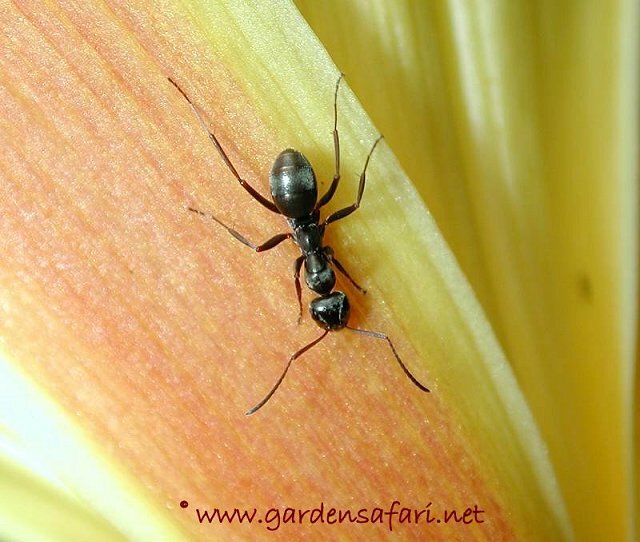 Ants live in colonies, many of which have a complicated structure with queens, workers and (winged) males. Some colonies have specialised workers, such as extra large animals protecting the colony (the so-called soldiers). Slavery, agriculture en cattle keeping are not uncommon and colonies also involve in wars with eachother! Identifying species often is a very complicated task.